From initial consultation through to your wedding day, time is taken with you. 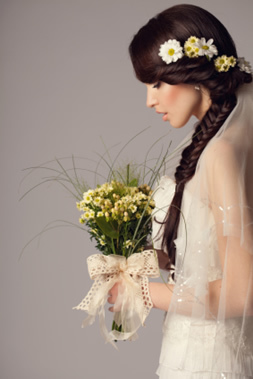 Hairdressing, Flowers and make-up are so important to making your day special. 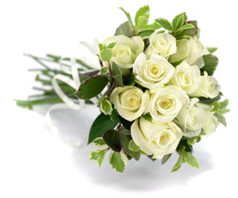 Our complete bridal hair & floristry service is designed to compliment and enhance all aspects of your wedding day. When it comes to style, Shear Genius will ensure that we give you personalised couture hairstyles to suit the occasion. Book a trial run for your hair, we do two different styles for £60.00. We also offer wedding make-up, manicure or pedicure, gel or acrylic nails. Come in for a free consultation. Our florist will produce individual, inspirational floristry designs for the Church, Bride, Bridesmaid, Groom, Page Boy, Table Arrangements, Corsages & Button Holds. Our flowers are always high quality, obtained from of the very finest sources. Staffordshire for your wedding party. Sit back, relax and enjoy being pampered in preparation for your big day. For more information please call 01785 819444, or contact us via the website. We now take a £100 deposit.